Normally, the equipment used to complete a job plays the part of the unsung hero. But those in charge at Lewis Sign Builders, Inc. think of their fleet of sign trucks as more than just tools in the toolbox. Instead, they’re a point of pride for this family-owned business that’s served the greater Austin community for four decades. Three L60R HiReach models featuring 63’ working height and 56’ working side reach. Each machine has a main winch capacity of 5,900 pounds and a jib winch capacity of 500 pounds. 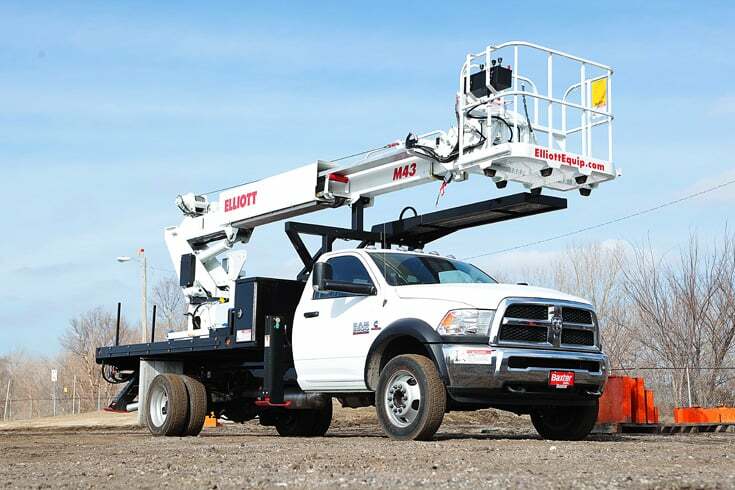 One M43R HiReach that has a 48’ working height and 38’ working side reach, and features main winch and jib winch capacities of 2,000 pounds and 500 pounds. One G85F HiReach model, boasting a 90’ working height and 58’ working side reach. Its main winch is rated for 5,900 pounds while the jib winch is rated for 1,000 pounds. 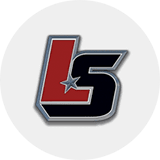 Each machine of the Lewis Sign fleet features easy-to-use DynaSmooth controls in the work platform and can be customized with kits and attachments unique to sign and lighting jobs. 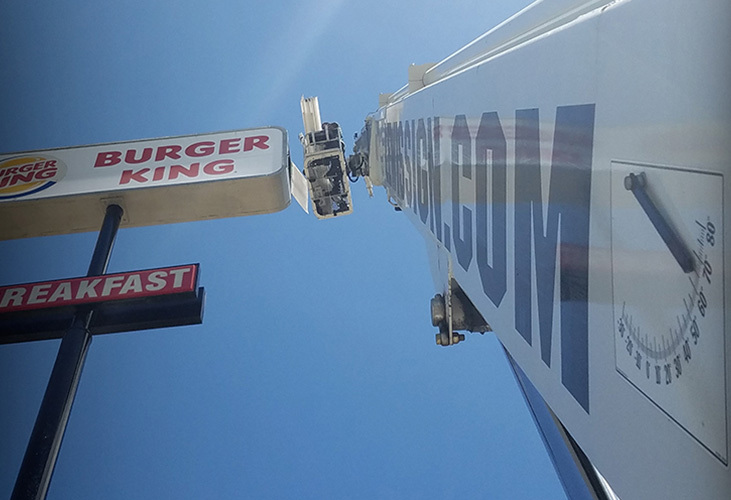 In today’s sign business, maneuverability and ease of setup are arguably as important for service firms as working height or winch weight ratings. Sign trucks need to be as nimble as possible, navigating parking lots or rights of way to reach a work area without disrupting traffic or customers’ businesses. Company president John Lewis said a recent job proved that point. Plus, Elliott machines just look sharp. Good design and capabilities that match the application and get the job done—that’s all you need, right? It certainly helps, but John Lewis said the biggest factor driving his decision to switch brands and run a fleet of Elliott Equipment Company sign trucks was customer service after the sale. At Elliott, we’re committed to providing the best buying experience possible. But it doesn’t stop there. Through our network of dealers and distributors, we maintain relationships with customers that are built on understanding their work and trying to make it easier. Elliott Equipment Company sets itself apart by building machines based on the evolving needs of our customers. Then, we back that up by offering superior customer service and industry-leading warranties, including a lifetime structural warranty on all HiReach machines. 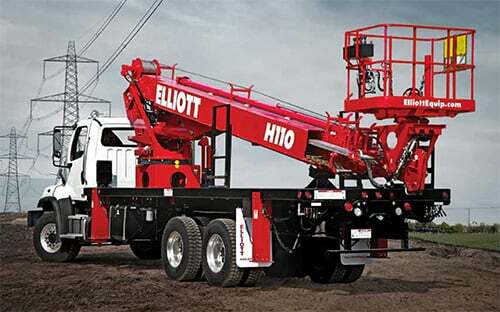 Elliott’s multi-functionality, low-maintenance design and outstanding resale value give you the lowest cost of ownership in the business, maximizing your ROI and peace of mind. Want to know more? Contact us to discuss your needs. We’ll walk you through our lineup of machines and help you determine which unit or units will add the most value to your operation. President, Lewis Sign Builders, Inc.